Socialite Zari is just not about to run out of ideas. Last Month, she hit a bridal shop in South Africa to shop for a wedding gown which left many excited but as it turned out, she used the dress during her White Party that was held at Guvnor on December 27, 2012. 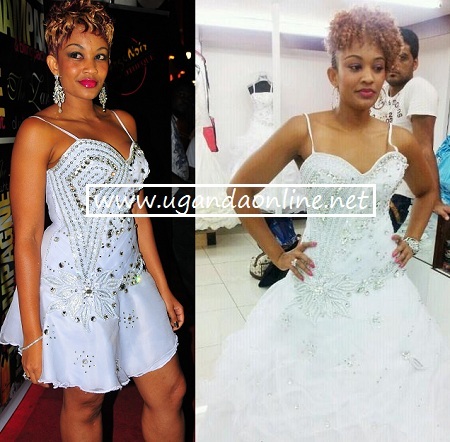 Zari simply detached the 2in1 wedding dress and hit the club. Again its not clear what was going on here but chances are their wedding was called off following the rocks that hit their affair to the extent of coming out and saying that she was not getting married and not in luv with anyone. Using a wedding gown at an All White Party simply leaves a lot ot be desired. The year 2013 is different for the couple as they have taken their Public Display of Affection to another level. During the boat cruise, Zari almost 'mounted' Ivan on the boat as they celebrated their rekindled love. Ivan Ssemwanga and Zari's wedding date might not be so much of an issue like bringing the Lamborghini to Kampala was but one thing is for sure, they've learnt that in love you do not only gaze at each other but you also look in the same direction together.